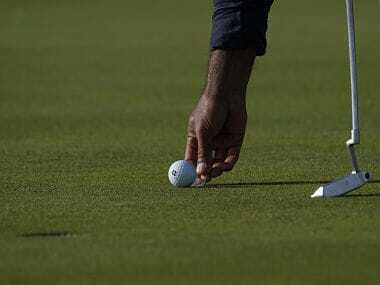 New Delhi: Ace golfer SSP Chowrasia today clinched his third Asian Tour title at the Panasonic Open as he pipped compatriot Rahil Gangjee and Sri Lankan Mithun Perera on the first extra hole in what turned out to be an exciting end to the event. Chowrasia rolled in a 15-footer birdie in extra time to cap a sensational comeback as he was five shots off the lead during the start of the day at the USD 300,000 event sanctioned by the Asian Tour and Professional Golf Tour of India (PGTI). With his trademark short game in full display at the Delhi Golf Club, Chowrasia returned with the day's low score of six-under-par 66 highlighted by eight birdies to finish on 12-under-par 276. "I worked very hard for this win because I wanted to boost my confidence. It is three years since I last won and I will take a lot of positives from the win," said the 36-year-old Chowrasia, who won his first Asian Tour title at the 2008 Indian Masters, on the same venue. "I've lost in two play-offs before but it never crossed my mind. I was focussed on making the birdie putt in the play-off. I always had the belief that I could win on the Asian Tour again and I did," he smiled. After turning in 35, Chowrasia fired five birdies that included three in a row from the 15th hole which was the turning point in the thrilling final round which saw the lead exchange hands on numerous occasions. "At the start of the day, I was thinking that if I could shoot a four or five-under, I will have a chance to win. I was confident I could catch the leader. I played very well on the back nine and the hat-trick of birdies proved to be the turning point," Chowrasia explained. Gangjee battled tooth-and-nail after a poor front nine 37 but was in contention again following an eagle on 14. After dropping a shot on 16, he held his cool to birdie the last for a 71 to join the play-off. 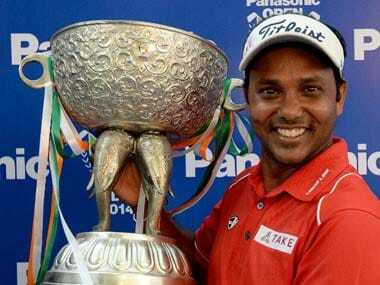 The dejected Indian rued the missed opportunity to win his second Asian Tour title after leading for three days. "I knew the momentum would swing through the final day and I told myself to play normally and not to worry too much about the leaderboard. "I missed out on a couple of chances towards the end and that just took the game away from me. It was a tough contest in the end with lot of contenders but SSP played the best golf to come through," said Gangjee. Playing in his first ever play-off on the Asian Tour, Perera missed out on the chance to become the first Sri Lankan champion on the Asian Tour after narrowly missing a 10-footer birdie putt in extra time. He ended the day with a 70 highlighted by two opening birdies. "Everybody had a chance to win today. I did good but Chowrasia but played better than all of us. I'm happy with my finish. I'm so excited to be in the play-off. Now I believe I can do something on the Asian Tour. I will try and get one trophy this year," said the 27-year-old.